Sahaja Yogis, of Gujarat, Rajasthan and Maharashtra, on behalf of the National Trust are delighted to inform you that by the Grace and Blessings of our Beloved and Divine Mother, a three days programme of National Sahaja Yoga Seminar & Christmas Puja is being held at SahasraraDham, Nargol, from 23rd to 25th December 2017. On behalf of National Trust you are invited to share the joy and bliss of divine vibrations on this Holy land during the International Christmas Puja 2017 at Sahasrara Dham, Nargol. Registration for Seminar expenses can be made in INR at Nargol . They should intimate by 10/12/2017 their participation in the event through mail to the organizers and registration can be done onsite. Registration fees is same as per above. However, Payment by draft should be considered as the last option, if CBS branch is not available nearby. It has been observed that some drafts are lost in transit or received quite late leading to inconvenience to organizers and yogis. 2. For Seminar Amount deposited in groups, Badges will be handed over to one person at one time only. 3. All Sahaja Yogis/Yoginis are requested to kindly send their Seminar Amount before 15th December 2017 so that proper arrangements can be made at Seminar and Puja site. 4. No Puja money needs to be paid for children below six years of age. 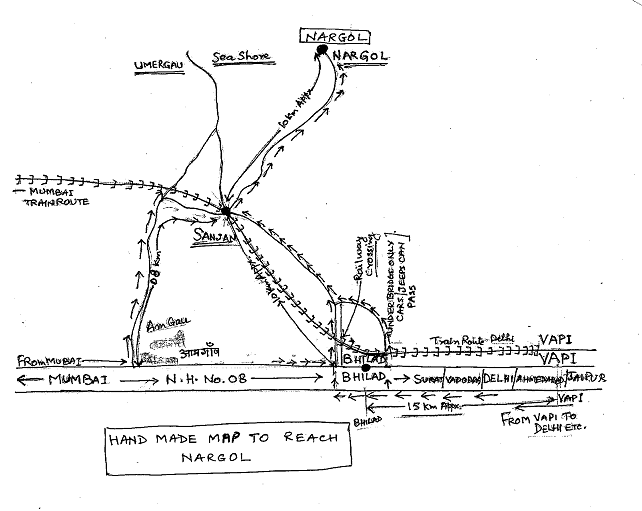 Nargol is only 170 Kms from Mumbai, 150 Kms from Surat, 280 Kms from Baroda, 400 Kms from Ahamdabad,35 Km from Vapi, 20 kms from Bhilad which is situated on NH 8 which goes from Mumbai to Delhi [As per attached handmade map]. From this village, we have to go to Nargol on State highway. When coming from Mumbai Bhilad comes first then Vapi, Surat etc. Puja site : Sahasrar Dham , Nargol. To &Fro Train Time Tables are attached herewith for the trains uptoVapi/ Bhilad&Sanjan from Mumbai /Delhi/ Ahemdabd etc. From Vapi/ Bhilad&Sanjan everybody can get Bus/Taxi/Auto etc. A Bus, can be arranged on prior intimation if the persons are in sufficient nos. for a bus on chargeable basis. 4. Ahemadabad (appx. 400km from Nargol). Nargol is situated on the sea beach. It is 20 km.from Bhilad, Bhilad is situated on N.H. no 8 (Mumbai To Delhi).If you come from Mumbai Bhilad comes first then Vapi, and if you come from Surat / Vadodara/ Ahemadabad/ Delhi etc. It comes after Vapi. Total Amount (Child) @ Rs. ADULTS YUVA SHAKTI (12-25 Yrs.) CHILD (6-12) Yrs. Coupons shall be given to Group Leaders. For Larger Groups, there could be more than one Group Leader. Registration amount as per the above details may please be deposited either directly in Account No. 51342011003897 in the name of “Sahaja Yoga Mahotsav Nargol Gujarat” payable at Vapi/Surat, Gujarat.